A Costochondral separation, sometimes known as a rib separation, usually occurs after a direct impact. This injury occurs when a rib becomes separated from the costochondral joint (made from cartilage) which is also attached to the breastbone. The area will be very painful, especially when breathing deeply, and it can take several months to fully recover. Symptoms of a costochondral separation include a sudden point of pain where the rib meets the chest bone or sternum. Patients often describe a popping sensation. The initial pain may subside, only to gradually get worse again. Pain is acute with deep breaths, coughing and sneezing. The costochondral joints are the joints formed by the ribs and the cartilage which attaches them to the breastbone (sternum). A separation of the bone from the cartilage is similar to a joint dislocation. 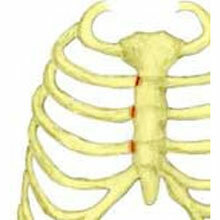 This injury may also be known as a separated rib. A separation of one of the costochondral joints usually occurs after an impact such as a fall onto the side of the body or being hit by something. Violent twisting movements can result in a costochondral separation. It can also happen from coughing violently. Treatment for a costochondral separation or separated rib as it is known is mostly rest. Seek medical attention to rule out any complications such as a fractured rib or pneumothorax. Your Doctor may prescribe painkillers to ease your discomfort and allow you to breathe more normally. This injury will usually take around 2-3 months to heal fully.